... is NOT a good thing!!! This is part of my back deck that doesn't have a cover. That ice is there and hard. I was able to sweep off the steps as it's still slushy there (Frosty has to be able to go down those steps to do his business). He loves to go under this picnic table when something is falling out of the sky. He's not crazy about bad weather. I know it's not hitting us nearly as bad as some parts of the country, but ice is ice. And, speaking of Frosty, he's been acting very strangely today. We worked at the cross stitch shop today (as usual on Wednesday and Friday) and everytime I moved, he barked. He wanted to go outside, then he didn't want to go outside when I got bundled up. He shivered and shook all day, and has been doing that since we got home. I know he gets cold easily, but he's wearing his sweater as he usually does when the weather is cold. I'm wondering if it the change in the weather. My previous poodle would go nuts when the barometer started dropping. If he is a little weather man - I hope he's wrong about the severity of this winter storm in Alabama. ....and boy am I ready for it. Enough of this cold weather already. It's been unseasonably cold in Alabama this winter - we've even had snow. 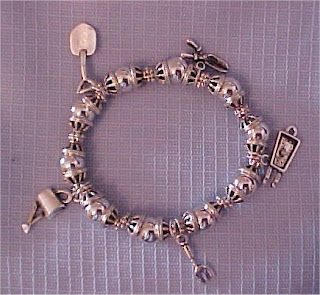 I just mailed this cute 'garden charm bracelet' to a customer, so maybe someone is getting ready early. Decided to go and remind myself just what I have listed in my little online jewelry shop . Here's another 'spring like' bracelet. 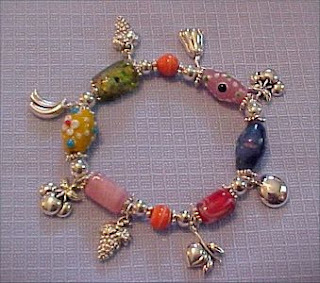 This one features lampwork beads and fruit. Quite colorful. These bracelets and more are available - all offer free shipping. Working on a new web site - something I just love to do. Can't really show it till the client sees it, but I can't wait. "I" love it - I hope she does too. ... and the only thing that helps the neuropathy in my feet. One of the many lasting side effect from chemo or Herceptin - and VERY uncomfortable. 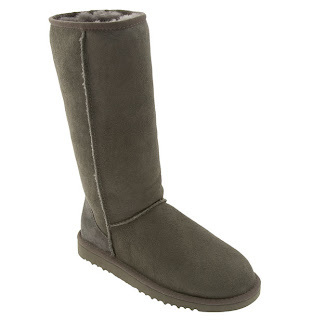 Bought the UGGs last year after doing lots of market research - as this was a major purchase for me. They will last me the rest of my life and I love them. Ugly (well mine are) but extremely comfortable and the only things that keep my poor toes even remotely comfortable. ... are so much fun to make. I don't do a lot of crocheting, but these make up fast and add so much to a Barbie outfit. There are so many interesting yarns today, there's really a wide choice. And, different yarns yield totally different results. 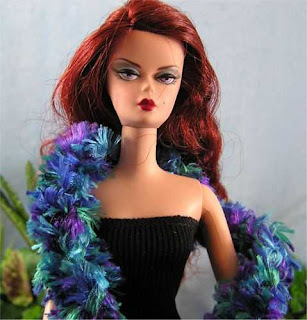 Then, there's the ever popular feature boa - not quite as much fun to make, but sure looks great on Barbie. All of these (and more) can be found in my doll shop - stop by and visit anytime. Putting away the last of the Christmas decorations today, I found an old paper bag in the back of the storage room. Curious, I opened it up to find a stack of vintage handkerchiefs and a vintage ladies slip. Now, when I say vintage - I don't mean the 70s or 80s (that's just a few years ago). These are from the 1930s or 1940s - certainly no newer. At first I thought it was silk - but I'm not sure. The inside looks handmade, but it does have tags, one is a heavy paper tag, so it hasn't been worn. The color is a peach with cream lace trim. It's been folded a long time, but doesn't look any the worse for wear. I'm sure the wrinkles will iron out. Now to figure out what to do with it. It's a "large" size (40), so who's going to want to wear it. And anyway, why would one want to wear a slip that's 70 plus years old??? Offer it on Etsy maybe? We'll see. Most of the hankies are stained - mostly from being folded for so long. Some of them are handmade, others just old. Then there are a couple with full designs. 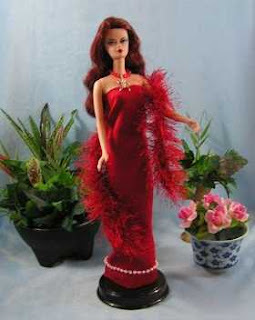 I'm thinking I'll try a vintage hankie Barbie dress with one or both of them (wish that was an original idea, but it sounds like a good one anyway). ...and if I don't see the 'inside' of a blog template for awhile it will not hurt my feelings. I'm sick of them. But then, they does anyone in their right mind have 4 blogs. Just sort of happened, though I can't say they're all real current - will try and work on that. And, if you're a frequent visitor here you might not even see the difference - but I surely do. I still don't have my post titles looking the way I want. I tested this out on another blog (also on blogger) and it looked perfect, then when I loaded it here where it's going to live - it's different. I have no idea why, and my brain won't wrap around that at the moment. I've actually worked on these changes for days (when I could spare the time) and am ready to move on to the next one... I'm 'updating the look' of all of my blogs. So, my goal was to post on at least one blog each day - didn't make it yesterday, but maybe the future will hold more writing, and hopefully in the future you'll find something at least quasi interesting to read on one of them. ...but I will get these blogs revised the way I want. Wasn't around the computer today, but I did think about it. Haven't resolved my problem yet, but maybe leaving it for awhile will let my brain work while my fingers are doing something besides typing. ... well, I guess not wasted, I've learned several things that will NOT work. I had a great list of "to do" things today, and have done none of them. I decided I wanted to update my blog layouts. Sounds easy right?? Well, I can't get mine to do what I want it to do. Obviously I want it to do something it doesn't want to do. I've been at it all day. Did walk away for awhile and rode my stationary bicycle thinking that might clear my hear. Didn't work (well, I did get some good exercise - but that's all). Now, I've run out of time and much move on to something else. Work in the cross stitch shop tomorrow, so won't get back to it till Saturday. I do love designing websites, templates, etc. But when I hit a snag, it's difficult to walk away and time just flies by me. Barbie arrived in doll world when I was too old for dolls. The closest we had was a "Tony" doll - you could work on her hair, but she wasn't nearly as much fun to sew for. My grandmother did teach me to make clothes for her (and for myself) and I've loved sewing ever since. 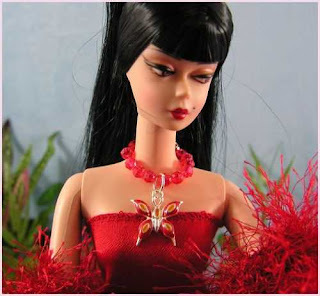 A few years ago, I started talking about Barbies and how cute they were. My hubby (always on the lookout for an easy gift for me) decided to start giving me Barbie dolls. After awhile, "I" decided to make a Barbie dress. My sewing machine was old and failing so we went on my birthday that year (the last year my sweet hubby was alive) and I got a new sewing machine AND serger (which I have a love/hate relationship with). One thing led to another and I've been making Barbie outfits ever since. I have so much fun designing and making elegant gowns and accessories. Then, almost as much fun dressing and photographing them. I've recently gotten a new "chair" to use as a prop - but haven't taken any photos with it yet. Many times I'm designing as I go - and sometimes I'm more pleased with the results than others. This one was particularly fun and I love the outcome. And this one didn't turn out 'exactly' as I'd planned - but definitely different and cute. Haven't been around much lately. Was sick from about the middle of November till after Christmas. Broncitis and flu - not much fun - and when I don't even feel like being on the computer - I'm sick. Better now and enjoying the new year with out of town family - and a special visitor. My son & his family from St. Louis are here - and a local friend has gone to Gatlinburg for New Years and I'm dog sitting with her little Pomeranian - Teddy. Frosty and the cats are not particularly impressed. However, at the momenet it's working out quite well as Teddy has decided he loves my son & his family (and they're pretty impressed with him too). Even my grandson (who is NOT a dog person) has made friends with him and thinks he's cute (he's really adorable). As I type this, he's sitting next to my DIL with his head resting on her laptop. I think they'd take him home with them if they thought they could get away with it.